plus links to other reports and websites etc. The old Leyland Reservoir in Clayton-le-Woods has now been demolished. Clayton-le-Woods, Back Lane site office during the the reservoir opening. Thanks to Kingswood Homes you can now download your own copy by clicking the image on the right. The Reservoir was demolished in Nov 2013 but a memorial garden has now been constructed by the A6 road opposite The Pines Hotel at Clayton Green. An information board has been erected to show a short illustrated history of the reservoir. 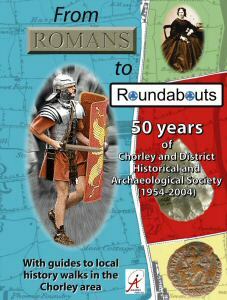 Our very own book of the Society history with lots of local history walks in the Chorley area.